The Great Johnny Cash at his home in Hendersonville, Tn. in 1974. Ken Gets off the first shot. I was working for my Father, who at the time , had started another business to go along with his photography studio in Palm Beach. He called it Newspix, and we had an assignment to photograph Johnny Cash, to promote his upcoming European tour. I went with the writer who was my Dad's partner, we drove to Hendersonville, Tenn. in his car. We only had three days to do this, so we jumped right in. On the first day we got the feel of things, I got to know Johnny Cash and June Carter Cash a little bit, so they would be more comfortable when I was shooting. We mapped out a plan, and set up the photos we wanted. Johnny's property was huge, 4.6 acres, and the 13,880 sq.ft. house was on Old Hickory Lake. Their 200-foot long lakeside home set on a solid rock foundation had an outdoor swimming pool, bell garden, four large, 35-foot round rooms, seven bedrooms, and five full baths. First we went to his garden, he posed for me and was not difficult to deal with at all, very friendly and down to earth. Then I took some shots of him around his docks, fishing with his son, John Carter Cash, the only child of Johnny and June. 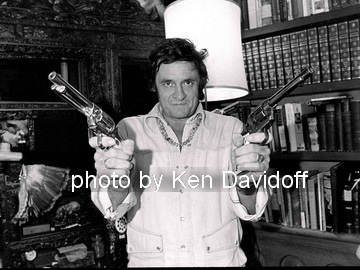 I did some interior shots of the home with Johnny Cash and June Carter Cash together, then we went up to his personal study, that's where I got "The shot", Johnny was reading from the Bible, and taking notes, then all of a sudden, the next thing I know, I've got this huge gun pointed at me. Luckily I got off the first shot. That was one of the most memorable photographs of my entire career. The next day we shot at his private recording studio, just down the road from the house, it looked like a southern mansion, with big white columns out front. He posed for some headshots there. Later that day, a tour bus came by the property, Johnny went out to greet them, and sign autographs, he was great with his fans. After Johnny's death, the 18-room home was listed for sale and Barry Gibb ,and his wife, Linda, purchased the Cash family home to use for songwriting. This turned out to be one of my favorite photo shoots of all time, the chance to photograph one of the greatest, Johnny Cash. 1974 at Home in Hendersonville, Tn. Let Your Hippie Out !